The little church in the suburbs suddenly stopped buying from its regular office supply dealer. So, the dealer telephoned Deacon Brown to ask why. "I'll tell you why," shouted Deacon Brown. 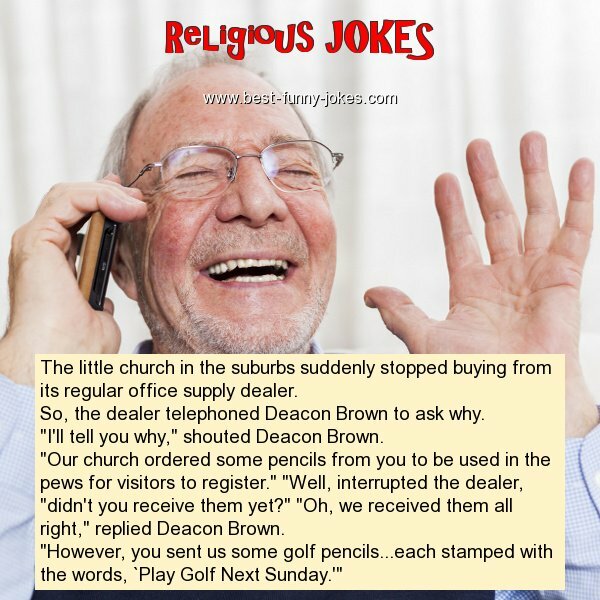 "Our church ordered some pencils from you to be used in the pews for visitors to register." "Well, interrupted the dealer, "didn't you receive them yet?" "Oh, we received them all right," replied Deacon Brown. "However, you sent us some golf pencils...each stamped with the words, `Play Golf Next Sunday.'"